Millions of birds and bats are killed annually by wind turbines, including our precious national symbol, the Bald Eagle. In 2013, President Obama extended, for 30 years, a no-penalty phase for wind energy companies whose turbines kill eagles, This was done in order to foster development in green renewable energy, however it did not truly take into account the millions of deaths that would occur from such a decision. Additionally, no practical monitoring program was implemented to accurately track and count the number of deaths caused by the wind turbine blades, therefore allowing wind energy companies to cover up and lie about the number of Bald Eagles and other precious species killed on their farms. The following article covers the recent fight back by the state of California against 30 year Take Permits for wind energy companies. The original article and original sources can be found here. It gives a thorough description of the rash and illegal nature of this decision by the USFWS and why California was able to set it aside. On August 11, 2015, the U.S. District Court for the Northern District of California set aside a U.S. Fish and Wildlife Service (USFWS) rule authorizing 30-year permits for the incidental take of Bald and Golden Eagles (the “30-Year Permit Rule”). The 30-Year Permit Rule, which was issued on December 9, 2013, had increased the maximum duration of incidental take permits issued under the Bald and Golden Eagle Protection Act (BGEPA) from five years to thirty years. The court found that the USFWS violated the National Environmental Policy Act (NEPA) by failing to conduct an environmental review of the 30-Year Permit Rule. As a result of the court’s decision, pending any appeal, the maximum duration for incidental take permits for bald and golden eagles will be five years. The decision will impact long-term financing of wind and other renewable energy projects. In 2007, the USFWS removed (delisted) the bald eagle from the list of endangered and threatened wildlife protected under the Endangered Species Act (ESA). However, Bald and Golden Eagles remain protected under the BGEPA and Migratory Bird Treaty Act (MBTA), which prohibit the “take” of Bald or Golden Eagles without a permit. On September 11, 2009, the USFWS promulgated first-time permit rules under the BGEPA for the take of Bald and Golden Eagles associated with, but not for the purpose of, otherwise lawful activity (the “Five-Year Rule”). Under these regulations, the USFWS can issue permits authorizing individual instances of take when the take cannot practicably be avoided. The USFWS can also issue “programmatic” permits for up to five years for instances of take that are “reoccurring, [are] not caused solely by indirect effects, and that occur over the long term or in a location or locations that cannot be specifically identified.” Currently, there is no means to acquire a programmatic permit under the MBTA. 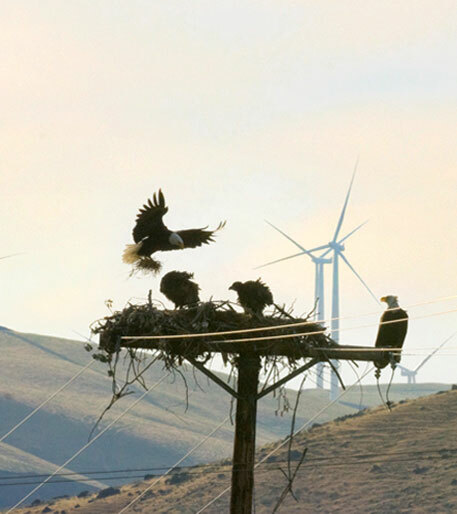 Separately, on May 2, 2013, the USFWS announced the availability of its Eagle Conservation Plan Guidance: Module 1 – Land-based Wind Energy, Version 2 (ECPG). The ECPG supplements the USFWS’s March 2012 Land-Based Wind Energy Guidelines (WEG) by providing specific guidance for conserving Bald and Golden Eagles in the course of siting, constructing, and operating wind energy facilities. The developers and operators of wind energy projects are not required to comply with the ECPG or the WEG. However, the USFWS believes that following the ECPG will help project developers and operators comply with laws and regulations relating to, and avoid the unintentional take of, Eagles. The USFWS also has explained that, although following the WEG does not relieve project developers and operators of the responsibility to comply with applicable legal requirements, if a violation occurs, the USFWS will consider documented efforts to follow the WEG in deciding whether to bring an enforcement action. The ECPG and WEG are unaffected by the court’s decision to set aside the 30-Year Permit Rule. NEPA requires that a federal agency, such as the USFWS, prepare an Environmental Impact Statement (“EIS”) for any “major Federal action significantly affecting the quality of the human environment.” Alternatively, under regulations promulgated by the Council on Environmental Quality, a federal agency may prepare a less detailed Environmental Assessment (EA) to evaluate whether an action may have a significant environmental impact; if, after preparing the EA, the agency finds that the proposed action would not have a significant impact, they can issue a Finding of No Significant Impact (FONSI). In addition, federal agencies may establish “categorical exclusions” designating “categories of actions which do not individually or cumulatively have a significant effect on the human environment… and for which, therefore, neither an environmental assessment nor an environmental impact statement is required.” However, any categorical exclusion must provide for “extraordinary circumstances” in which a normally excluded action may have a significant environmental effect. The court set aside the 30-Year Permit Rule, finding that the USFWS violated NEPA by not preparing an EA or EIS to evaluate the rule’s potential environmental impacts. In particular, the court found that the USFWS’ decision to increase the maximum duration for programmatic eagle take permits from five to thirty years was not merely “administrative” in nature, as it would reduce public participation in permitting decisions from once every five years to potentially only once in thirty years. In addition, the court found that, although long-term permits would be subject to five-year reviews by the USFWS, the review process effected a potentially substantive change by shifting the burden from the permittee to satisfy the criteria for permit renewal to the USFWS to determine whether any changes to the permit are necessary. With respect to the second prong of the categorical exclusion, the court found that the USFWS failed to explain why the environmental impacts of the 30-Year Permit Rule are “too broad, speculative, or conjectural to lend themselves to meaningful analysis.” The court further noted that the USFWS prepared an EA for the 5-Year Permit Rule, indicating that the effects of the 30-Year Permit Rule may be amenable to analysis. Finally, the court found that, even if the subject categorical exclusion applied to the 30 Year Permit Rule, extraordinary circumstances preclude the USFWS from relying on the exclusion. The court observed that there is “substantial evidence” that increasing the maximum duration of programmatic eagle take permits may have “highly controversial environmental effects” on Bald and Golden Eagles. Among other factors, the court noted (i) the USFWS’ acknowledgement that Eagles can be killed by colliding with wind turbines, (ii) the National Park Service’s opposition to the 30-Year Permit Rule, (iii) concerns expressed by USFWS experts regarding the decision to proceed without NEPA review, and (iv) similar concerns expressed by Native American tribes and other environmental stakeholders. In internal USFWS correspondence, the Eagle Program Director for the Division of Migratory Bird Management, Eliza Savage, who had direct responsibility for drafting the 30 Year Permit Rule, warned “once again, we find ourselves having taken sloppy action that we will have to do over instead of doing things the way they should have been done to begin with.” In the meantime, the maximum duration for a programmatic Eagle take permit will be five years. If you catch wind of a future wind turbine development, garner support from your community, region, and state. Wind turbines affect birds of prey, but they also implicate other non-environmental issues, such as interfering with cellular connection and becoming an eyesore in otherwise beautiful landscapes. There are many reasons for a group of people to want to prevent a wind project in our around a community.